Why is public speaking important? As a personal brand it is important to make sure that people are aware of your ability to solve a specific problem. If you’re a motivational speaker, you must be able to help people untap latent potential that could transform their lives. If you’re a weight management coach you must be able to give people the knowledge, tools and motivation to shed the pounds. Public speaking is a skill we use every day. Some people utilise this skill better than others, but as a personal brand it’s one that should not be ignored. 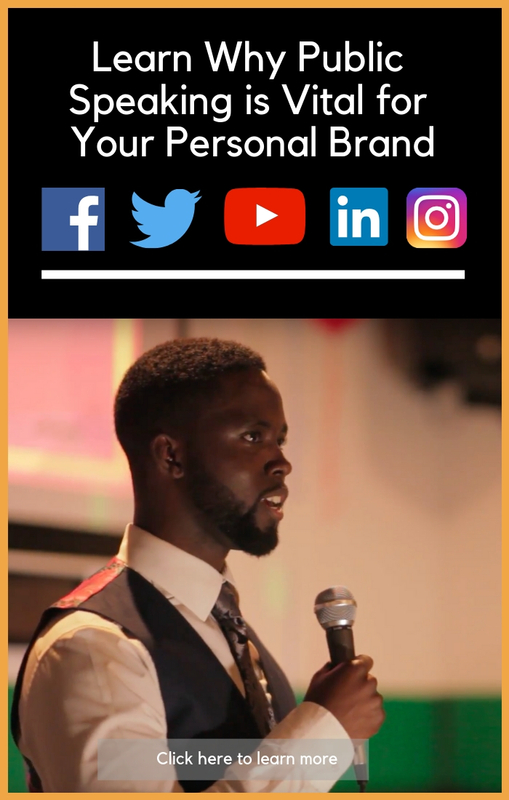 In this article I’m going to highlight the importance of public speaking and how you can use it to market your products and services. Public speaking is important because it quickly positions you as the expert. It enables you to form a relationship with your target audience quickly and more effectively. It is also a great marketing tool based on this very reason. People want to experience the person, and not always behind a screen. Saying that, you have the opportunity to record all talks and leverage them online to attract more people to your community and eventually your business. In addition, write down a list of things that you like and don’t like. If you’re stuck, ask a group of trusted friends and family members to get an idea of what they think you are good at or possibly appear to be passionate about. Gather themes from all this information and make a decision on what makes sense to embark on. If you already know what your expertise is in, or should be in, you can skip this step. Once you have done the above, you’ll begin to clearly outline themes arising. These themes can help you shape an outline on topics and subtopics that you can focus your expertise on. These topics should be listed in logical or chronological order, especially if your business includes services. What’s also great is that you can create content, courses and books based on this very framework. Use this framework to create signature talks that eloquently and effectively allow you to communicate your message to your audience. I learned that it’s about how you organise information that provides value for our target audience. The way to attract speaking opportunities is to network and produce an insane amount of high-quality content on a regular basis; content that is consistent with your brand and educates and empowers people about a clear niche topic. Depending on who you are, you will lean more toward one compared to the others. Furthermore, it’s best to focus your efforts where you are strongest. On the contrary, a balance of all three, in some way is always good to adopt. People connect with those who are relatable but are confident with what they know. Using all of these devices will help you develop a relationship with them. This is a simple structure anyone can follow, and can quite easily be used for video, webinars and live talks on stage. Remember to practice your talk as often as possible. A study has shown that great speakers practice their talk 200 times before they release it to the world. Excellent business owners solve the biggest problems in multiple ways. Gather as much knowledge and understanding on your topic, and start listing targeted keywords that have great search volume. Start to produce video, audio and/or written content around your topic. The aim of the game is consistent publishing as regularly as possible. Aim to post at least 1 – 5 times a week, bearing in mind the more you post the better. It would be a complete waste of time if you were producing content that no one looks for. My advice is to do the keyword research before you start posting anything. For example, My name is Daniel and I’m a Brand consultant. I help millennial digital marketers build an attractive personal brand so that they can acquire more customers. I do this through online courses and one-to-one consulting services. Now, you don’t need to know this word for word, however, you do need to confidently mention the 4 elements in this statement. Practice it regularly because it’ll give you the confidence you need when speaking to new people. Show people your content, books and videos so that they validate your expertise. People will search for your name on Google, and you want to make sure they have something worth searching for. Do as many talks as you can and film everything. Even if you are alone, get your camera stand, mobile phone brace and film yourself using your smartphone. With this, you can develop macro and micro-content which will be used as content, and serve as marketing. Use platforms like YouTube and Instagram to promote your content on a consistent basis. The main aim is to make sure you know what problems you want to solve, create a signature talk, organise it into topics in themes and deliver talks that you can film and redistribute. This article should be a stepping stone for helping you understand why public speaking is important, especially for a personal brand.